A superb effort from all who competed James Jones, Jessica Jones, Jack Dixon, Rebecca Pearson, Hannah Potvliege, Emily Bell, Rachel Osbaldestin, Daniel Bell, Mia Gamble, Katelyn Payne, Amelia Cort, Jessica Henderson, Jasmine Henderson, Sherrie-Lei Causer, Fiona Jones, Sarah-Jayne Sams, Leah Patterson, Liam Hunter, Liam Lincoln, Declen Scott, Jackson Barber, Ben Barber, Jack Strangward and Charlotte Hedley. Our biggest turn out ever! Proud of everyone who took part. 1st Emily Bell, 2nd Rachel Osbaldestin, 3rd Lilly Carr. A superb effort from all who competed James Jones, Jessica Jones, Ebony-Mae Taylor, Jagjeet Nayyar, Jack Dixon, Alyssa Eilbeck, Ruby Eilbeck, Aiden Hedley, Rebecca Pearson, Hannah Potvliege, Emily Bell, Rachel Osbaldestin, Daniel Bell, Mia Gamble, Jonny Michie, Alex Michie, Sam Shenton, Katie Strangward, Jack Strangward and Charlotte Hedley. 1st Jagjeet Nayyar, 2nd James Jones, 3rd Arran Gargett, 4th Ayden Gargett. 1st N/A, 2nd Rachel Osbaldestin, 3rd N/A, 4th Aiden Hedley. 1st Sam Short, 2nd Betsie Cleworth, 3rd Jichun Li, 4th Ben Anderson. 1st Charlotte Hedley, 2nd Fiona Jones, 3rd Sam Shenton, 4th Jonny Michie. 1st Katie Strangward, 2nd Karl Sichert, 3rd Mia Gamble, 4th Jack Strangward. 1st N/A, 2nd Team 4, 3rd Gagjeet, 4th RAZ. 1st Alex Young, 2nd Zachary Beresford, 3rd Daniel Bell, 4th Jenson Boughen. 1st Arran Gargett, 2nd Aaron Lloyd, 3rd Evan Alderson, 4th Peter Mathias. 1st Emily Bell, 2nd Emily Wilson, 3rd Rachel Osbaldestin. 1st Nathan Haywood, 2nd Jonny Michie, 3rd Alex Michie, 4th Jack Strangward. 1st Katie Strangward, 2nd Sarah Bell, 3rd Fiona Jones, 4th Charlotte Hedley. A fantastic effort in Kata from Ruixuan Li and Cindy Huang. Some fantastic kumite from all great efforts to all who took part Ruixuan Li and Cindy Huang in their first competition too! Also well done Ben Shovlin. Lets try to get a few more involved for the 5th Kyokutan Invite. On the 12th April 2016 we held our annual Easter Club Competition, we had a couple of technical issues hence the delay of the sparring for safety reasons. Sparring will be held during the next Tuesday lesson, students not sparring will train as usual with an instructor. Places for the Kata were as follows. Kata Under 9 White Belt - Special well done to all in this category as many have just trained two weeks and gave it a go! Runners Up - Jack Ogden, Jared Tague, Damon Deagle-Simpson, Ethan McGregor and Callum Bell. Runners up - Aaron Lloyd, Nathan Haywood and Helena Shovlin. Fantastic effort by all! Should all be very proud of yourselves. Places for the Kumite were as follows. Kumite Boys Under 9 - Special well done to all in this category as many have just trained two weeks and gave it a go! Runners Up - Jack Ogden, Daniel Bell, Damon Deagle-Simpson, Ethan McGregor, Oliver Dixon, Dylan Robinson, Lewis Carter, Logan Luke and Max Burgess. Runners Up - Callum Blakey and Mac Emery. Runners Up - Rachel Osbaldestin and Juliet Sanders. Runner Up - Zoe Papagiannouli. Runners Up - Jonathan Michie, Carl Shovlin, Ben Shovlin and Thomas Shovlin. Fantastic effort by all! Should all be very proud of yourselves some future stars. 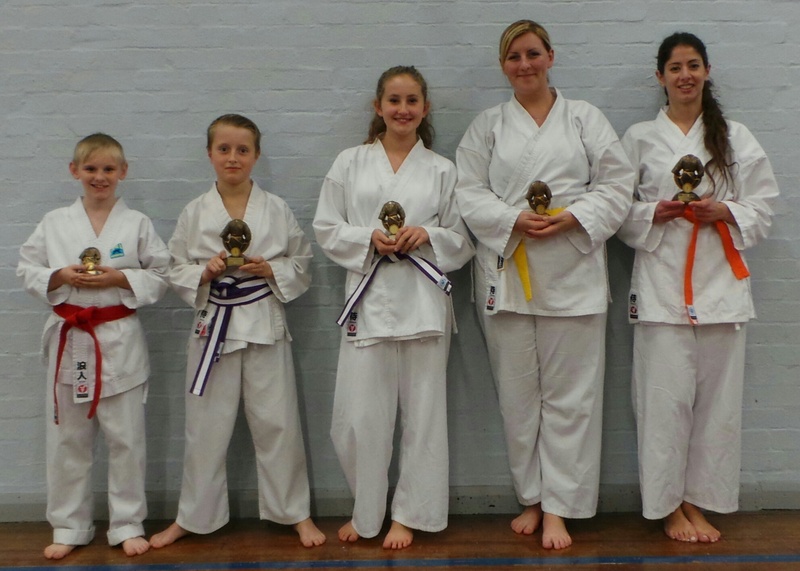 A fantastic effort in Kata from Mia Gamble, Emily Bell, Nathan Haywood, Katie Strangward and Kim Hedley and a double fantastic effort from Corey Carr coming back after unfortunately forgetting his kata and having the composure to do it a second time to completion. Katie and Jack Strangward with a great effort. Nathan finishing second in a thrilling final, both fantastic fighters! Well done to Evan Alderson, Owen Alderson and Mia Gamble who all did really well in their categories. We hosted our first competition on the 17th May 2015, we invited Kyokutan Karate Club to take part. Between both clubs we had 40 entries in Kata, 4 Team Kata and 34 entries in Kumite. We would like to thank everyone for taking part and thanks to everyone at Kyokutan for helping make the day a success. We look forward to hosting another competition and open the door to more karate clubs next year. The Easter Competition took place tonight with Easter Eggs as trophies. Everyone did fantastic from beginner to experienced student. Well done to everyone! Runners up - Kevin Yang, Ben Vickers, Evan Alderson, Isla Scott, Maeghan Mason, David Mason, Mia Gamble, Emily Wilson, William Thornton, Peter Mathias and Daniel Bell. Runners Up - Alex Hughes, Emily Bell and Stevielee Archer. Runners Up - Simon Mathias, Georgia Mason and Mathew Mason. Runners Up - Thomas Shovlin, Lee Haywood and Benjamin Shovlin. Runners Up - Evan Alderson, Kevin Yang, Peter Mathias, Dylan Robinson, David Mason and Daniel Bell. Runners Up - Tom Shovlin, Corey Carr, Ben Shovlin, Alex Hughes, and Stevielee Archer. Runners up - Mathew Mason, Lee Haywood, Nathan Haywood and Simon Mathias. Well done everyone who took part, I was impressed with everyone's Kata and Kumite. On the 16th November the club attended the Tyne and Wear Open held at Rainton Meadows, Katie Strangward, Aspasia Christodoulou and Corey Carr competed in the Traditional Kata. All categories were open grade from beginner to Black Belt. Katie and Corey both competed in the under 13s and performed very well but did not finish in the trophy places. Aspasia competed in the over 18s and achieved 2nd Place. Well Done all for taking part! A special well done to Emily Bell and Corey Carr in their first competition who did well in their kata categories but placed outside the trophies. Also a special well done to Ben Shovlin and George Gazis in their first competition in kumite you did very well. Also well done Jonathan Robinson who did very well in the men's kumite. Well done to all who took part especially the recent starters who all performed really well for the length of time they have been training. Runners up - Emily Wilson, Isaac Davies, Jonathan Robinson, Noah Bones and William Thornton. In March Nathan Haywood entered the South Tyneside Open and finished in 3rd Place in light continuous sparring. Katie Strangward 1st Kata, Ben Marley 2nd Kumite, Nathan Haywood 3rd Kumite. Well done to Jonathan Robinson who did really well in his first competition especially in the mens division. As you can see we are very proud of our club, and all of our members.